The Rose Bowl has a rich tradition of sports enthusiasm attached to it and for good reason. It’s a great weekend of fun, competition and partying. The college crowd eats it up. Which is why this coming Friday, July 23, 2010, will be such an exciting day for folks in Pasadena, California. The Rose Bowl is going green. 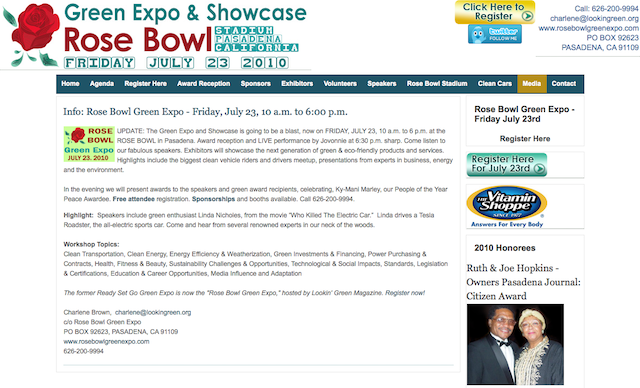 From 10 a.m. to 6 p.m., the Rose Bowl will host the Rose Bowl Green Expo. One of the speakers will be Linda Nicholes, star of the movie “Who Killed The Electric Car” and herself a green enthusiast. She drives a Tesla Roadster, an all-electric vehicle. The great thing about electric vehicles like the Tesla Roadster is that they put out zero emissions, which is why green enthusiasts love them so. And it’s also why Linda Nicholes will make a great speaker at the event. When it comes to going green, you don’t have to go to the Rose Bowl – but now can. And we think that is pretty cool. Be the first to comment on "The Rose Bowl Goes Green"